Posted on 22 November 2012 and filed under Miscellaneous. At hand embroidery workshop in May I showed how to embroider in stem stitch, chain stitch, French knot stitch and lazy daisy stitch. Ladies who participated in the workshop tried each of the stitches, and used all of them for the final work, hand embroidered heart – licitar. I already published tutorials on first three stitches. I would like to give you the pattern used at the workshop and before I do that, I should explain the remaining stitch, lazy daisy. So here it is: lazy daisy stitch tutorial. Lazy daisy stitch is similar to chain stitch, the basic element – the loop, is the same. However, stitches do not continue next to each other to form a chain, they are worked from the centre of the flower out. Bring the needle and the thread to the front of the fabric. It helps to hold the thread down with your left thumb towards left at this point. If you are right handed. If you are left handed, then of course, everything is mirrored. Insert the needle into the fabric almost at the same point where the thread came out and bring it up to the front of the fabric at a distance that will be the length of a single stitch – a single petal. Form a loose loop and make sure it is below the tip of the needle. Pull the needle and the thread through, gently forming the petal. Insert the needle into fabric almost at the same point where the thread is now emerging, at the tip of the petal, outside the petal this time. Pull the needle and the thread through to the back of the fabric – doing so will secure the petal. For second and consecutive stitches continue as for the first stitch. Bring the needle to the front of the fabric in the centre of the flower, next to the point where it emerges for the first stitch-petal. Repeat until you have reached the number of petals you wanted your flower to have. What can you do with the lazy daisy stitch? Flowers, flowers, flowers… :) Leaves. Or any other pattern, depending on the way you combine the number of petals, their length, angles between them etc. Experiment with that and try multiple stitches with embroidery thread in different colours, I am sure you are going to like it! Following are some examples of what I do with the lazy daisy stitch. 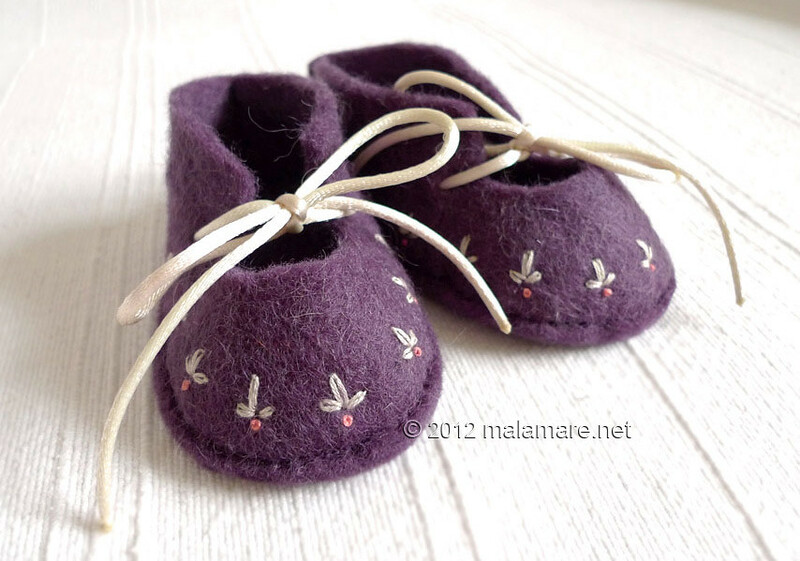 Hand embroidered lazy daisy flowers on felt baby shoes. 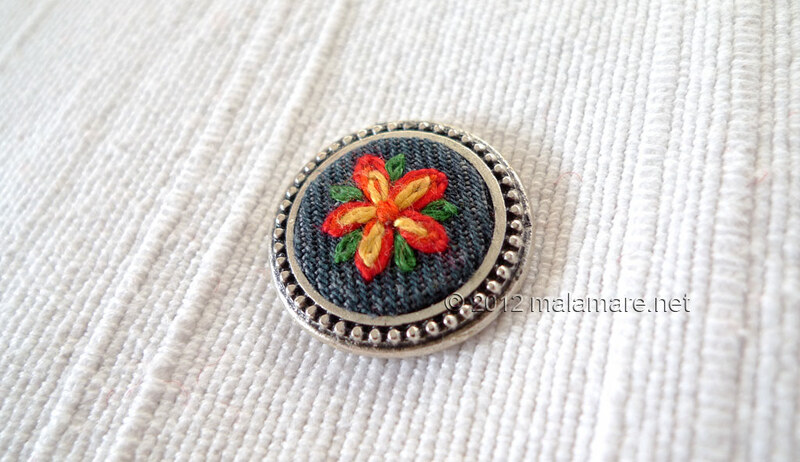 Red and yellow flower and small leaves on denim. This will be a pendant for a necklace. Pattern on another pair of felt baby slippers.